Smartphone comparison – Which is the best phone for you? Home » MCSA Blog » Smartphone comparison – Which is the best phone and system for you? 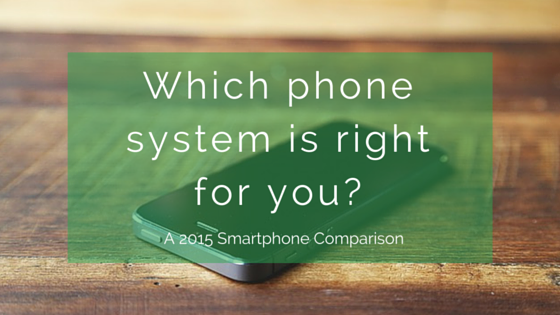 Smartphone comparison – Which is the best phone and system for you? Over the past decade, mobile phones have gone from being portable telephones to fully-operational pocket-sized computers. Being home computer technicians and laptop screen repair Sydney-based experts, we often get asked by our customers which smartphone they should choose, and how they can make sure they’re using their devices to their full potential. With smartphone technology evolving at such a mind-boggling speed, it’s no surprise that many people don’t even know where to begin. Purchasing a new smartphone is a pretty big financial commitment, and not one you can afford to make without really understanding what it is you’re buying. As much as we enjoy choosing our favourite coloured handset (Rose Gold anyone?) and debating the merits of glass over aluminium casing, it really is the operating system that will determine how much you love (or hate) using your phone. This is the heart of your device, defining which apps you can use, and how your phone feels and functions. The jargon around operating systems can be pretty confusing at times – even for computer technicians like us. To make it easier, we’ve broken it down into the major pros and cons as we see it for the three main smartphone operating systems: iOS, Android and Windows OS. Design and aesthetics: Elegant materials, quality build and Apple’s signature clean, fuss-free styling will never go out of fashion. Performance: IOS feels light and smooth to use, takes up minimal battery power and puts much less strain on hardware than other systems. It is also the most user-friendly, which makes it great for technophobes! Easily integrate with your other Apple products: Choosing an IOS phone means seamless integration with all your other Apple products and services – like computers, tablets, and the Apple app store. High-quality accessories: iPhone is easily the most universally catered for device. If you want a bullet-proof back cover, smart watch, selfie stick, acid resistant screen guard or fitness band, you can have it all. Apple keeps you in its web. When using Apple products, it’s virtually impossible to integrate with other non-Apple items. Limited customisation, and fewer available apps. Android – as seen in Google phone, Samsung, Motorola + many more. Customisable: If you’re a computer technician or a bit of a tech guru, this is a major benefit. Basically, it means that Android allows you the ability to modify the operating system, unlike Windows OS and iOS which are ‘closed’. More devices to choose from: To date, there are more than 100 devices which operate on the Android system. This means that as a customer you have a world of options when it comes to which exact handset you want to use. Google support: Google is one of the largest, most innovative companies in the world. When using Android, you have the benefit of Google’s continually enhanced user experience and industry leading support. Leading the tech pack: Android was the first to pioneer many tech breakthroughs, such as WiFi Direct, WebP images, multiple user accounts and screen mirroring support. Largest app store: As of May 2015, the Google Play Store offered an incredible 1.5 million apps. Not as secure as iOS and Windows OS. App compatibility issues for different versions of Android – not all phones run the same version of Android, which means some apps won’t work on some phones. Over time, Android phones tend to become slow due to large cache buildup. Clean, minimalist functionality: The main motive behind the development of Windows OS is to increase user productivity. Accessing information is prioritised over whizz-bang apps. Microsoft support: Windows OS works great with other Microsoft services like Skype and Outlook, syncing calendars, contacts and emails. Other features like Here Maps , Here Drive and Here Transit offer fantastic offline navigation and geo positioning support. Integration with Office: One of the best aspects of having a Windows phone is that it works with the Microsoft Office suite, such as Word, Excel and PowerPoint. Security: Working as computer technicians for both residential and business customers, we know how important security is. With bit-locker encryption, secure boot and data syncing, you’re very well protected from breaches in data security. Of course, the final choice you make when purchasing a new smartphone will always come down to personal preference. We recommend going into a store and testing different phones and operating systems out, or calling your local computer technician at MSCA for more personalised advice. If you’d like expert help with choosing a smartphone or want to make sure you’re getting the most out of your device, give our team of home computer technicians a call – we’ll be more than happy to talk you through the options and help set up smartphones for you and your family.